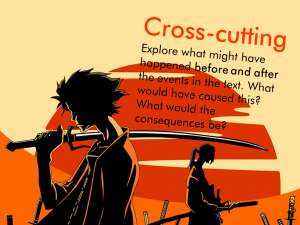 Dramatic Resources for Reading Texts in the Classroom | Eat.Sleep.Teach. In June I had the pleasure of spending some time with Avner Segall from Michigan State University. He talked about how teachers try very hard to add layers of pedagogy to lessons and often ignore the pedagogy implicit and hidden within the texts they use. He demonstrated how unpicking text, its motives and choices can give teachers all the material they need to create exciting learning. This made a great impact on me, but I was unable to fully translate it into classroom practice. Then, in July I completed an in-house coaching cycle and spent time working with a fantastic Drama teacher called Alex. In the lesson that I observed, she had eight ‘Explorative Strategies’ on display around the board. Students were given a scene from Oliver the Musical and asked to explore it using one or more of the strategies. The students were obviously familiar with the process, but the results were stunning. They were digging deep into the text and asking some very precise questions about its purpose and significance. I am now using this with all classes. Like any new approach it will need some time to embed, but the early signs are that students can see how the strategies help them to find greater meaning in the texts. What also pleases me is that I was able to connect ideas from History and Drama to create a powerful resource. I would love some feedback on this approach and, in particular, any suggested improvements. Hope you find them useful. Fantastic ideas for really engaging, active literacy in the History classroom – Drama lessons and PE have great ideas for AfL as well. Thanks for sharing these – first class design too!